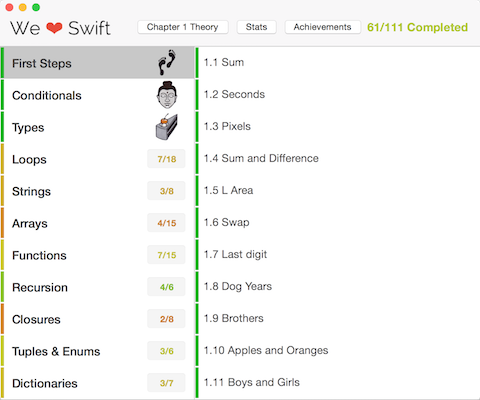 We’re proud to announce that our Swift Exercise Platform is finally available. It was an exciting journey to get from the original idea to an actual product. We have learned a lot and we hope that you will enjoy using it. Now that we reached a stable version with some neat features and a healthy collection of exercises we have great plans to expand this platform. We want to thank all the people who have supported us! We couldn’t have reached this point without you! After Swift was released we knew that a lot of people will want to make apps with it. We wanted to make an iOS course but we kept on hitting the same wall – there was no resource that will teach people enough programming to be able to make apps. We decided to make that resource – and more than everything – make it available for everyone – you can read the book and more about it here. The book was designed using a principle named Cascading Information Theory, which is used in games. It gives the reader the minimum possible snippets of information to gain the appropriate level of understanding at each point during the book. The book gradually shows the use of keywords and new syntax giving you time to practice every one of them and get comfortable using it. Solving and understating the exercises from the book will teach you how to solve many of the problems you will be facing when developing apps. Thanks to the people who give us feedback on their experience with the book we are constantly updating and polishing it. The most common request was more exercises – when we reached 100 exercises we were having doubts that people will enjoy solving so many problems. We were wrong! We are going to keep adding exercises to the book and sending you guys updates. The Exercise Platform complements the book by giving feedback to the student, checking for common mistakes and testing out his source code. The app also keeps track of your progress and rewards you with achievements. Keep track of your progress through stats and achievements. It’s important to have a sense of progression when you’re learning programming. Have an overview of how many exercises you solved every day and keep track of your progress over time. Get free periodic updates. We’ll increase the number of exercises over time, covering Swift 2.0 topics and adding more challenging exercises. Swift 2.0 support coming soon. The platform will support Swift 2.0 once it’s in a more stable state. How does the app evaluate my solutions ? Be one of the first 100 to purchase a copy and receive a 50% discount on one of our next books/ apps. We developed a general platform for swift exercises which we plan to extend to cover several domains. In the following months we’ll be focusing on 2 new books and accompanying training apps built on the platform. Just like Swift Programming From Scratch these books will be free to read online. Good understanding of OOP principles and design are essential to building great apps. Furthermore you can’t build anything more than an extremely basic iOS app without knowing the basics of OOP. The iOS SDKs are built using OOP so you can’t harvest their power without a good understanding of it. 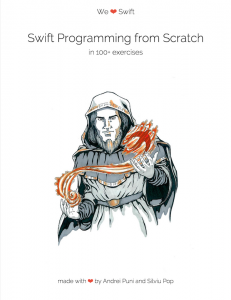 This book will be designed to teach you OOP from the ground up, and will make an excellent next book after you’ve finished Swift Programming from Scratch. We’ll also cover more advanced topics so that anyone can learn something new and interesting, whether you’re beginner or an iOS programming veteran. I just sent you a email. Thank you! Will you be releasing an iOS version of the app anytime soon? We’ll release an app that teaches you iOS programming in a simillar fashion. We’re working on it. As for porting the current app to iOS, we’re not working on that at the moment. When will you release the next two books?? over the coming 6-8 months. Hi, any update on data structure and algorithms in swift book. We started working on it! The exercise platform doesn’t seem to submit my code. It’s stuck on exercise 3.4. The round loading icon next to the submit button keeps spinning. Any ideas how to solve the problem? I’m running Swift 3.0 with XCode 8. Thanks! Hi The app doesn’t support Swift 3 yet. An update will be posted as soon as possible. Gotcha, thanks for the update!